This is a must see. Headed to theatres in March. Last spring it was revealed that the books “Night Work” by Randall Maggs and “Sawchuk: The Troubles and Triumphs of the World’s Greatest Goalie” by David Dupuis were being compiled and used as the basis for a biopic on former NHL goaltender Terry Sawchuk. Well… 10 months later we have a trailer for the film that’s set to be released in theatres on March 1st. Starring Mark O'Brien, the film covers Sawchuk's entire life growing up in Winnipeg and then starring in the NHL career with the Red Wings, Boston Bruins, Maple Leafs, Los Angeles Kings and New York Rangers. The legendary net minder played 21 seasons from 1950-1970. 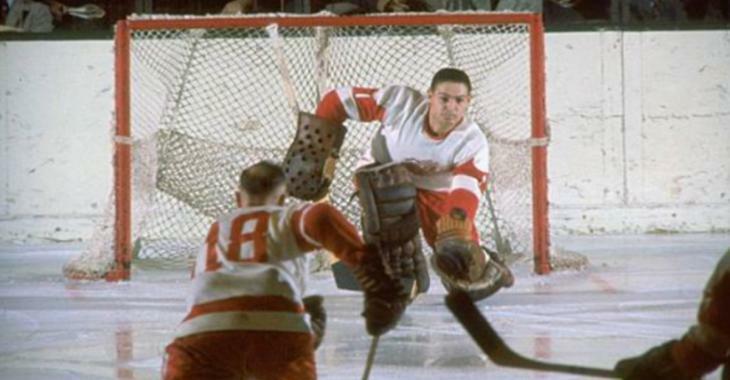 Widely considered to be one of the greatest goaltenders in history and perhaps THE greatest goaltender from his era, Sawchuk won the Stanley Cup three times with the Red Wings (1952, 1954, 1955) and backstopped the Leafs to a Stanley Cup championship in 1967. Sawchuk tragically died at just 40 years old after getting into an altercation with a teammate during a team barbecue. “Goalie” will appear in be only released in Vancouver and Toronto-based theatres on March 1.